The BNP led by Nick Griffin MEP is intending to march or drive ("motorcade") from Woolwich (assembling from 1pm) to the Lewisham Islamic Centre (opposite Lewisham Hospital) on Saturday. The route is uncertain but the march of several miles could take them through both Blackheath and Lewisham shopping centres which could mean some unpleasant exchanges of words. The BNP was last seen as a political party in Lewisham back in 2009 in the European Parliament elections, and maybe they are trying to catch up with UKIP and the EDL. Keep an eye on the local news for more details, as you may not want to have the BNP spoil your Saturday afternoon. I hope that local residents can work together to prevent the BNP intimidating local Muslims, the vast majority of whom deplore acts of violence, the same as everybody else in the community. That Facebook link is now reporting that the police have banned the BNP march in Woolwich and have said it must take place in Whitehall. There's a link in the Facebook entry to a Met Police press release page giving a full explanation, but there's a request on the police page not to publish links to it so I won't. Although if you follow the link to Facebook you'll find it there. Any idea why the BNP were intending to come to the Lewisham Islamic Centre? Is it the closest Islamic place to Woolwich? There's some info on the change of plan (no more than has been stated above, really) on the story on the BBC News website covering the court appearance of one of the suspects in the recent murder - last three paragraphs here http://www.bbc.co.uk/news/uk-22713349 . I'll be glad if they don't come to Lewisham - we all llive harmoniously together generally and we don't want people spreading hate and discord in OUR community!!! That's great. I didn't really want to spend my Saturday outside the Islamic Centre attempting to prevent the BNP from intimidating local residents. "Living harmoniously"? Seriously what world do you live in? Wish I lived there! "we all llive harmoniously together generally" seems entirely correct. The word 'generally' is important, as their are always a few nasty people trying to stir up hatred but that doesn't prevent the vast majority of us living harmoniously together. What we should resist is people coming to Lewisham trying to stir up hatred and possibly attack religious institutions, as has happened in incidents across the country (60 EDL rallies planned for this weekend spewing more hatred). 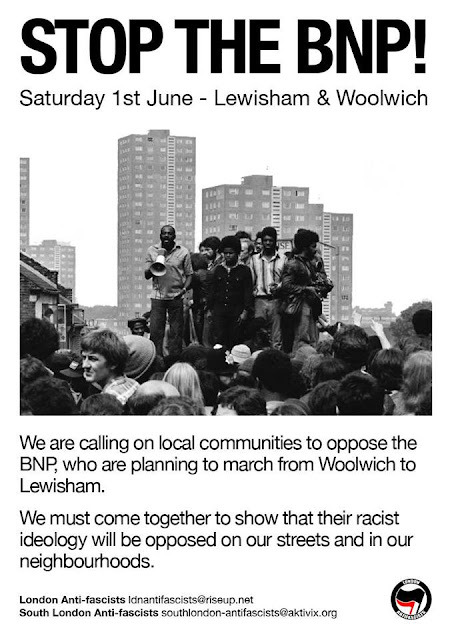 I'm still trying to find out if there is any point going to Lewisham Islamic Centre tomorrow to show solidarity with the local Muslim community against any possible attempt to illegally march there by the BNP. Sounds like it all stands a chance of getting very messy. If the official march is moved to Whitehall, my only concern is the police focus will be there, leaving the yobs and trouble makers of these groups free to cause trouble away from the main event. Obviously I realise the police will have thought this through too. Such a shame to see SO much money being spent on preventing these people behave like this. Just seen this full statement from the Met re the march. Thanks for all the updates: things have happened quickly to get this demonstration moved away from Lewisham and Greenwich. However the BNP are dropping hints that they have other plans on their website at bnp.org.uk, so keep an eye on things tomorrow. - Having initially said that they would defy the ban, the BNP has now agreed to switch its demo to Downing Street. - Unite Against Fascism has therefore cancelled its protest in Woolwich and is calling for people to come to Downing Street at 12 noon tomorrow to oppose BNP there. - South London Anti-Fascists will be meeting tomorrow at 11 am at the Imperial War Museum Gardens (Geraldine Mary Harmsworth Park), near the Russian memorial, and then travelling en bloc to Downing Street. - The rally at Lewisham Islamic Centre has also been cancelled.